I can make the trip from my office to my home in 17 minutes, if traffic and lights cooperate, and in 22 minutes, if they don’t. I’m embarrassed to admit how much anguish that five-minute gap has caused me. When I leave my office, my mind is often dulled from a day of recruiting talent. Though I enjoy what I do, being an executive recruiter can be very frustrating. Because we deal with rejection and disappointment daily, recruiters must be extremely persistent and remain unshaken by failure. Almost as important, they need to be able to switch off negative emotions at the end of the day. That’s often a challenge. When I get into my truck and head into traffic, I often take the frustrations of the day with me, and that causes me to lose perspective. When I should be unwinding from the day and looking forward to the blessings that await me at home, I dive right into frustration, which is insane, because so little of my commute is within my control. I can’t control how many red lights will stop me or how many blue-hair-driven Buicks will slow my pace. 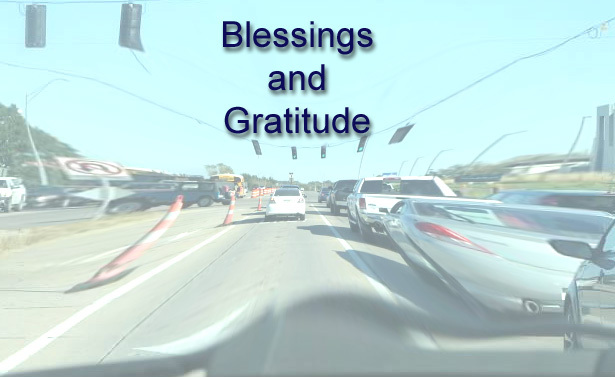 In my saner moments, I rationalize that God controls Buicks and red lights, and he uses them to remind me who’s in charge and what’s really at stake – 300 seconds. It’s easy to see that when I’m not staring at taillights, but when I’m on the road, those five extra minutes seem so much more important than they really are. I believe that unbalanced perspectives like this are common in many areas and that they cause us way more stress than they should. Maybe someone doesn’t return our phone call as quickly as we think they should, and we assume that they’re indifferent to our relationship. Perhaps a temporary illness slows us down or causes us to miss something important to us. It can seem like a rain cloud hovers over our proverbial parade, if we lose our perspective. I recently saw a sign that said, “Did you really have a bad day or have 15 bad minutes that you allowed to ruin your day?” We have all had truly bad days, but fortunately, the truly bad days are few and far between. Most of the time, a bad day is the result of our reaction to a disappointment, and we made it a bad day because we carried that disappointment with us through the rest of the day when we should have left it in place. I’m currently reading a book that I highly recommend to anyone who recognizes this misbalanced perspective in their own life. The title is “The Gift.” It’s written by Rhonda Byrne, and is a sequel to her popular book, “The Secret.” The theme of the book is that appreciation shields us from negativity. When we’re truly appreciative, we’re impervious to negativity. If we take time to count our blessings, we don’t have time to tally our frustrations and disappointments. When we’re truly appreciative, even if we recognize our frustrations and disappointments, we’ll put them in their place – deep in the shadows of our blessings. I try to do that now, when I feel those frustrations bubbling up on the road. Instead of focusing on other drivers who don’t drive to my expectations, I think about the blessings that await me at home. Instead of focusing on the minutes ticking by as I wait for a light to turn green, I am quietly thankful for the comfort of my transportation. Without it, I wouldn’t have the freedom to travel virtually anywhere I want, at any time and in any weather. If I’m successful in being truly appreciative, before I know it, I’m home and happy, because I didn’t let those 17-22 minutes pollute my mood. That sure beats the alternative.